With the holiday season in full force, we have our real tree up and decorated, the 'Charlie Brown Christmas' Pandora station on repeat and the smell of pine needles and cinnamon fill the air. One thing was missing.... there was nowhere to hang our stockings with care. This had to be remedied immediately. So, I decided to build a fireplace for our apartment! Cause, why not really. 1) Measure and draw out the height and width you want the sides and mantle to be. Gather enough cardboard to cover the job. This can be whatever size your heart wishes. 2) Measure out the cardboard pieces and cut accordingly. Note :: none of my boxes were the same size (they came from our recycling room, also known as, the free craft room! ), so this included a lot of measuring and chopping up of boxes. Use the duct tape to secure the cardboard together. To make things easier, it's best to find boxes that are all the same size, then you can just stack them and tape. I went the difficult route! 3) Set up the boxes against the wall you want to display the fireplace on to be sure the sizes are correct. 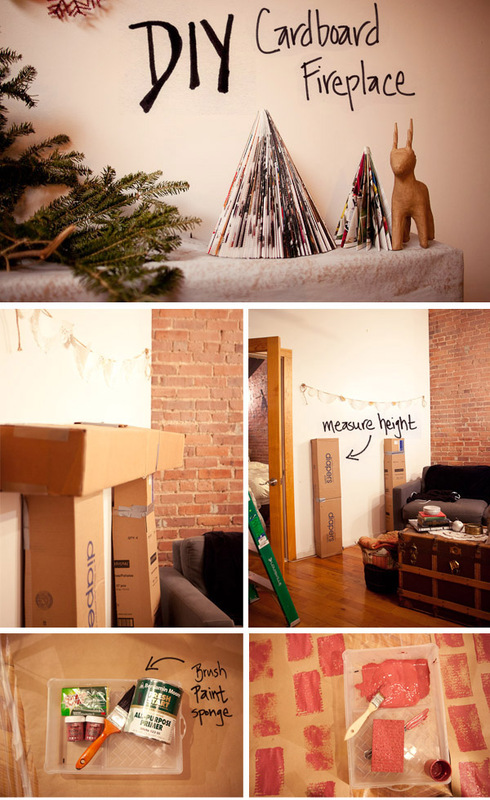 4) Measure and cut the kraft paper to match each of the sides and the mantle. You want enough to just wrap around the boxes like you're wrapping a present. 5) Lay out the kraft paper and using the sponge and brick red paint (I just grabbed paint samples from the hardware store - cheaper route), you are going to make a faux brick design. Remember with bricks, do alternating spots with each row. Note :: As with every DIY comes a few surprises! With this one I noticed after I finished my brick print that I lined them up wrong. My bricks go vertical instead of horizontal! It will be the new trend when making fireplaces, I can just see it now! 7) Line them up against the wall and be sure they are in place, then tape them together for stability. Since mine are open in the back, I placed a few heavier things - like change jars- in the bottom to keep the sides firmly in place. 8) Decorate your mantle and hang your stockings with care! 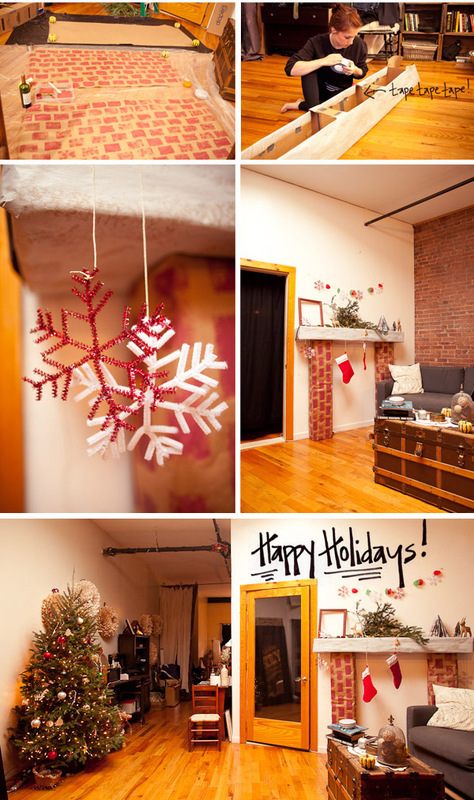 Hope those of you who also don't have the luxury of a fancy brick fireplace can appreciate this fun and easy DIY! If you make one yourself, please send me pictures. I'd love to see them!